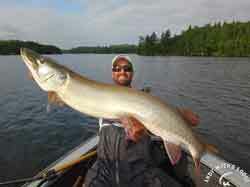 Andy Myers Lodge is the home to the ultimate hunting and fishing guides in Ontario Canada. 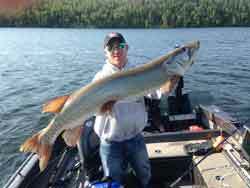 It’s your premier destination for fishing trips in Canada and amazing hunting trips. Whether your perfect excursion is on land or water, we have the best guides and spots to make your trip exactly how you pictured it. We have great packages and prices to ensure we can accommodate everyone looking for the ultimate outdoor experience of a lifetime. We have the best packages for beginning fisherman to professionals. Our American plans will have your complete trip covered. Along with the lodge accommodations, we will provide you with multiple meals, a great boat, dock services, maid cleaning services, fish cleaning, and packaging. We want you to enjoy all of the great fishing that Eagle Lake has to offer and let us take care of the minor details. Our Canadian fishing guides are simply the best. Come and see for yourself what Canadian fishing is all about! When it comes to hunting, there is nothing better than a full package from Andy Myers Lodge that will provide you with just about everything you need. We have packages designed for the game you are looking for if you’re planning to go hunting in Canada. If you are a die-hard deer hunter looking for a trophy whitetail, we have packages that are tailored to bringing home exactly what you desire. Our Blast and Cast combo will jam pack your day full of fishing and bird hunting from dusk till dawn. Our hunting guides in Ontario are experienced with the land covered and game hunted so you get the best chance at bringing home the big one. Here at Andy Myers Lodge, we pride ourselves on being the outdoorsman’s one-stop shop. We understand that getting time away from everyday life to pursue your passion is very difficult and that is why we have designed packages for almost every situation. Whether you are looking for a quick hunting trip with great results or a week-long fishing trip with a boat and great friends, we have the packages and prices to make your fantasy trip a reality. Our Eagle Lake Canada fishing and hunting guides are like no other. The packages and rates below have been proven to provide the best trips possible. Please feel free to explore all the different packages or our special weeks for a unique experience with our professional guest instructors. We also have special rates for large groups and we can custom make a pro-rated package for you based on your schedule. For those looking for a NO FUSS – NO MUSS, everything’s taken care of for you, inclusive vacation/fishing trip we suggest the American Plan Package. For those who enjoy doing their own cooking/cleaning on their own schedule or on a tighter budget, the Housekeeping Package is a good option. The American Plan PM Meal Only Package falls in between, make your own breakfast, pack your own lunch, have the big evening dinner in the lodge. Those who choose this package can deduct $180.00 off their American Plan pkg price. Regardless of the package of choice the staff at Andy Myers Lodge is committed to all personal services with a friendly atmosphere and to provide you with the best and most up to date information to make your trip the best it can be and a successful, memorable one. Our goal for each and every guest is to have you planning your next trip to see us before you even leave for home. 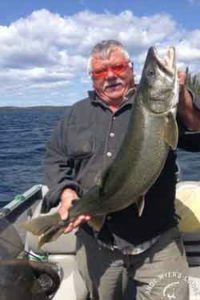 We also highly recommend our Guided or Partially Guided Packages, especially for first few trips, to help in your fishing success and knowledge of the lake system. About 70% of our repeat business is based a Guided or Partially Guided Packages, but regardless if guided or not we will do our best to provide you with the info you need to be on fish. All inclusive other than recreational drinks and personal snacks. Home cooked meals Breakfast & Supper plus your choice of Shore lunch or Box lunch. Daily cabin cleaning and towel/linen changes. 36 Gal free gas (6 gallons per day). 18 Gal free gas (3 Gallons per day). After deducting gas allocations the difference is $36.00 USD a day for 3 hearty all you can eat, home cooked meals, daily cabin cleaning and linen changes, unlimited ice, fish cleaning and generally more personal interaction time with staff/instructors. Because of the daily social gathering at meal times brings us all together each day before breakfast in the lodge, on the water if you see one of the guides or instructors, and again at dark in the lodge we are always around to assist you in daily up to date fishing info regardless if you are in for meals or not. Excellent trophy potential. This is a quality hunt at an affordable price. Limited openings available for the season. High return rates. (Fishing or small game hunting available if early tag fill.) Call for references. Accommodations with delicious home cooked meals. One guide per two hunters. Scouted and proven stand sites. Baited stands available upon request. Hunting private, leased and remote government land. Hunters enjoyed 95% opportunity with 75%+ kill if 8 points outside the ears or better. Please Note: Incidental wolf kill is no charge during the deer hunt with possession of non-resident wolf tag / small game license. Grouse and fox hunting also available if early kill. Completely outfitted, daily scouted birds, experienced professional guides calling, dogs, extensive decoy spreads, layout field and built on water blinds, transportation, bird processing/freezing. Limited Opportunities – 4 persons per week outfitted guided packages with exclusivity to private land leases. Hunt flight AM and PM, jump shoot ponds and fields or grouse hunt. Fish trophy walleyes, northern pike, bass, muskies, and trout midday. 6 day / 7 night accommodations, 16′ Standard Lund boat, home-cooked meals at breakfast and dinner plus your choice of shore lunch or picnic box for lunch, late model boats with new motors, 36 gallons of gas, daily dock and maid services, fish cleaning and packaging, use of boats and motors on 5 remote lakes at no charge, marked maps, seminars and daily updates. Pick up after early breakfast, drop-off before late dinner right off the dock. Fly-In may be substituted for 4WD guided backcountry excursion to a remote lake. Guided Packages include: 6 day / 7 night accommodations and all other American Plan amenities plus 1 day fly-in midweek to a remote lake, guide trips including shore lunch and 18 ft upgrade boat on guide trips and evenings. Guided 2 days on surrounding lakes. PLUS 18 ft. upgrade boat. Includes: 6 day / 7 night accommodations, 16' Standard Lund boats with new motors. 18 gallons of gas per boat, all towels, and linens, daily dock service, midweek maid service, use of boats and motors on 5 remote lakes at no charge, marked maps and seminars. Bring your own boat and enjoy free boat dockage and battery hook-up. (Single guide dates may be added at the current rate.) Any number of days may be pro-rated to fit your schedule and a package tailor made for you. You will be provided accommodations and be able to fish with our experienced, hard working, fun loving guides plus heated shelters, fish cleaning and proper equipment including ice augers and all hole drilling, on the ice fish fry's and a great time filled with many memories and experiences. You will be provided accommodations and be able to fish with our experienced, hard working, fun loving guides plus heated shelters, fish cleaning and proper equipment including ice augers and all hole drilling, on the ice fish fry’s and a great time filled with many memories and experiences. John Gillespie with Woods and Waters TV has, for past 5 yrs, made this his last ice fishing trip and show of the season. John says, it’s always one of his best destinations of the season and at his urging, we are now offering the same trip for our guests. He has had numerous e-mails for us to do this and we will soon post some clips from previous trips. Come experience and be a part of it! GUIDED 4WD SAFARI TO 28 ULTRA-REMOTE LAKES. A Unique Wilderness Adventure You Won't Soon Forget! Travel by heavy duty 4WD with our local guides to lakes way back in the bush country. Be it Walleyes, Northerns, Bass, Lake Trout or Muskies we can take you into a lake seldom fished while they’re ready to do battle.